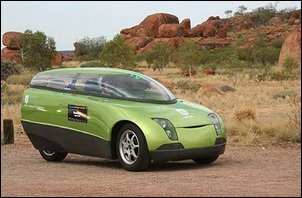 One of the most impressive aspects of the University of South Australia’s Trev electric two seater car is its long, transparent acrylic canopy. It simultaneously mixes excellent vision, weatherproofness and a slippery aerodynamic shape. 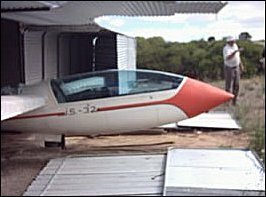 The canopy was blown by Ian Linke of Aviation Acrylic Mouldings, a specialist in making canopies for gliders and human-powered vehicles. We were so intrigued by the results – and their potential in automotive applications – that we decided to go along to Ian’s small backyard workshop and see how he does it. Ian uses two different approaches to making canopies. The first is ‘free-blowing’, a technique we’ll cover in detail in a moment. The other is ‘stretch moulding’, an approach that Ian has optimised for forming canopies with compound curves and other shapes impossible to make with blow-moulding. Ian was happy to give an over-view of stretch moulding but did not wish to reveal details of the exact process he uses. So let's take a detailed look at free-blowing. 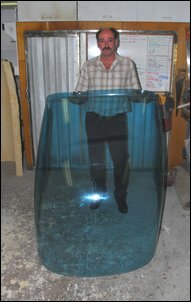 The oven is critical to moulding plastics into optically transparent shapes. 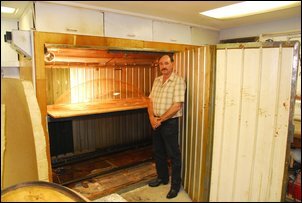 Ian has made his own oven that is large enough to cope with mouldings 2.5 x 1.8 x 1.6 metres in size. The oven is made of galvanised sheet steel walls sandwiching 100mm of rockwool insulation. The roof is made of Masonite (a thin pressed wood panel) that’s also insulated. Ian comments that if he was producing a new oven, he’d use Masonite for the walls as well. Heating is provided by high-mounted electric elements that have a total power of 6kW. Thermostatic control is achieved using a small commercial electronic control unit that switches the elements on and off. 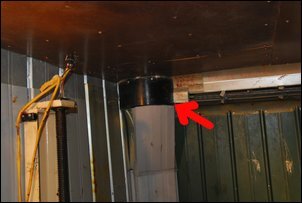 The temp sensor hangs from the ceiling of the oven. The oven takes up to 5 hours to reach its 170 degrees C operating temperature. To ensure that temperature gradients through the oven are kept as low as possible, two ducted fans (one arrowed) draw air from floor level and then blow it past the heating elements. Blow-moulding air is supplied by a compressor mounted remotely. To ensure that this air is warm, the compressed air passes through a long copper tube located within the oven. Most of the blow moulding is done using cast (not extruded) acrylic sheet. 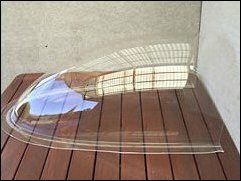 Ian likes using acrylic (rather than say polycarbonate [ie Lexan] ) because it can be broken (important if trying to exit a crashed vehicle); it has a relatively hard surface (about the same as aluminium); and its optical clarity is extremely good. Typical sheet thickness is 3mm although when it’s blown, the thickness varies over the canopy, being thinnest at the top. The acrylic can be either crystal clear or tinted. The first step in the blow moulding process is to make a template that shows the side profile of the finished design. This profile is then laid flat and mirror-imaged, forming a plan area twice the size of the side profile. A thick baseboard is then cut out to form this shape (sometimes with end additions to prevent sharp corners). The baseboard, that takes the full blowing pressure, is made from 25mm thick plywood. An air fitting is placed in the middle of the baseboard. Often a baseboard will be used to form a single canopy that will be later cut in half, allowing the production of two symmetrical canopies in the one blowing job. Around the edge of the baseboard is placed a strong frame. It is made from 25mm angle and is bent to conform to the baseboard shape. One face of the angle is repeatedly slotted to allow this bending to occur. The acrylic sheet is laid on the baseboard and the angle-steel frame is clamped down on top. 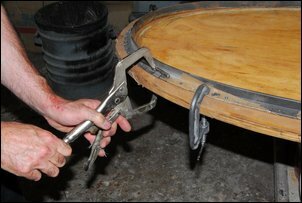 Multiple G-clamps and vice-grip pliers are used to hold the frame in place. Heavy grade, high temperature grease is used to help seal the acrylic to the baseboard – this also stops the acrylic from embedding itself in the baseboard. The assembly is then placed in the preheated oven. Typically it will take 45 minutes before the acrylic has softened sufficiently. Note that as it is heated, the acrylic goes through several stages of shrinking and expanding before it is ready to be blown. Air pressure is then applied through the baseboard air attachment. Typical pressures are 35–40 psi – a regulator is used to ensure correct pressurisation. 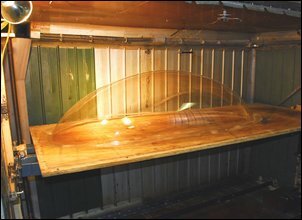 The acrylic is blown until a predetermined height is reached. Ian marks this height with a cotton thread strung over the canopy between two uprights. Once the right height has been achieved, the heating is switched off and the oven door is opened. The internal air pressure is maintained until the acrylic is hard enough to be gently flicked with fingernails and still remain firm. The air pressure is then released and the moulding quickly unclamped from the baseboard. Speed is important because as air under the moulding cools, it contracts - and so outside air pressure is applied to the moulding. If the air pressures are not quickly equalised, this can crack the moulding. The canopy also contracts as it cools – a large moulding can shrink 5-6mm. If restrained during this shrinkage, cracking can again occur. In this state the canopy has lots of internal stress and so is relatively fragile. Annealing reduces these stresses and so greatly improves the strength of the canopy. Annealing is carried out by returning the canopy to the oven at 80 degrees C. The canopy is kept at this temperature for an hour and then power is switched off. With the oven’s good insulation, it takes 12 hours or so to gradually drop to ambient temperature – and this slow decline in temp completes the annealing process. The canopy can then be cut to shape. 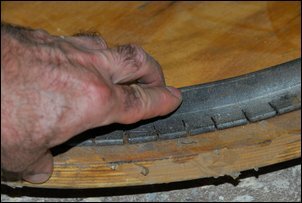 Cutting is carried out using a thin blade in an angle grinder. 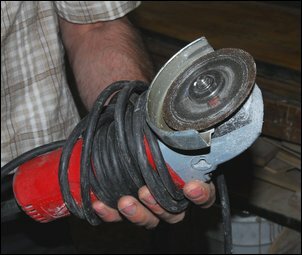 Because the user needs to hold the canopy in one hand and the angle grinder in the other, Ian suggests a 4-inch grinder is the ideal size. The flanges are first cut off and then the frame into which the canopy is to be attached is placed over the canopy. Cut lines are marked and then the canopy is cut to shape. Before attachment is made to the frame, the canopy is re-heated in the oven to 60 degrees C. It’s then clamped to the frame and the whole assembly placed back into the oven for 6 hours at 80 degrees C, then allowed to gradually cool overnight. 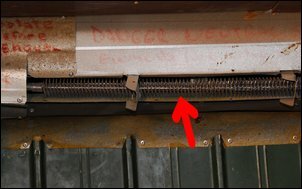 The canopy can then be attached to the frame with either screws or glue – if glued, epoxy or automotive-style Sikaflex are used. 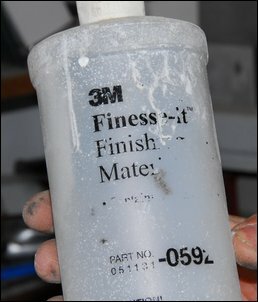 An alternative material to acrylic is PET. This plastic is used to form ultra lightweight canopies for human-powered racers. The canopies are normally made in 1mm PET sheet; the final result can be flexed by hand. PET has a shorter life than acrylic – Ian estimates that if exposed continuously to sunlight, about 2 years. Acrylic blow-moulded canopies cost in the range of AUD$500 - $2500 (all prices including GST but minus freight). PET canopies cost from $132 - $264. Blow moulding is limited in the variety of shapes that can be produced. A blow moulding also has a material thickness that varies across the moulding. On the other hand, stretch moulding can be any shape and has a much more uniform material thickness. However, stretch moulding is a much more expensive, involved process. To replicate an existing canopy design, Ian first takes a plaster mould. This female mould is then smoothed before a male fibreglass mould is made from it. In turn, this mould is smoothed (and smoothed and smoothed!) until its surface is near perfect. The fibreglass mould is then placed in the oven beneath the plastic sheet. 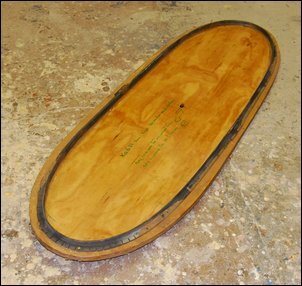 The mould is then moved upwards by a jacking system that causes the mould to push into the acrylic sheet, stretching the sheet over the mould. With another step in the process that Ian does not wish to divulge, a shaped canopy is then formed. So what is the durability of a blow-moulded acrylic canopy? Ian suggests that, if exposed to sunlight on a daily basis, a well-made acrylic canopy will last ten years. He’s also quick to point out that the acrylic sheet so often seen crazed and cracked after a much shorter period has not been annealed, and the cracks are the result of the internal stresses in the material. 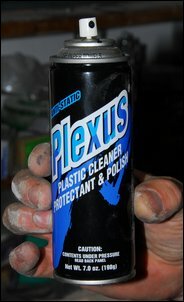 …and Plexus anti-static cleaner for routine use. You might be wondering about the optical clarity of the blown or stretch-moulded shapes. In short, on all the sample mouldings Ian had available, it was simply superb - much better in fact than a typical car windscreen. So what about in-car use? The biggest legal downfall for a custom street-driven vehicle appears to be the need for windscreen wipers. Acrylic will not cope with being scraped by windscreen wipers, so an alternative method (like using a blast of air) might need to be implemented. The legal implications of the shattering characteristics of the material itself would also need to be examined.